Dedicated to bringing you topical programs with pragmatic takeaways, The ELEVATE Leadership Series 2018 Webinars start with expert and up-to-date insights to the North Korean Labor Legislation. 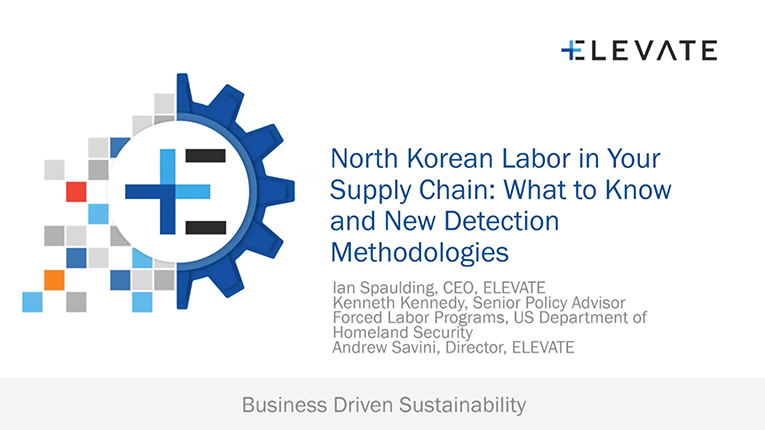 In the first webinar of the series, ELEVATE CEO Ian Spaulding and Director Andrew Savini are joined by special guest speaker, Kenneth J F Kennedy, Senior Policy Advisor, Forced Labor Programs with the US Department of Homeland Security. They will distill and simplify what you need to know about the law enacted by Congress in August 2017, Countering America’s Adversaries Through Sanctions Act (H.R. 3364) – Title III, Subsection B. The Act assumes that goods, wares, merchandise, and articles made anywhere in the world by North Korean citizens or nationals are forced-labor goods. This allows U.S. Customs and Border Protection (CBP) to ban import shipments that CBP believes are made with forced and/or prison labor. And while companies in the US are interested in understanding their North Korean labor risks, companies the world over understand the importance of finding new and improved investigative and detection techniques and methodologies. These approaches emphasize that such labor – whether it’s North Koreans in China, Syrians in Turkey, or Rohingya in Bangladesh – must first be detected and brought above board before we can do anything about them or for them. Join the experts as they outline the implications for brands and retailers, and recommended next steps.